Roz Weitzman’s World of Chinese Comfort Food Is ePublished! – where it will also be made available at the iBookstore and the Barnes and Noble NOOK bookstore™ in the very near future. 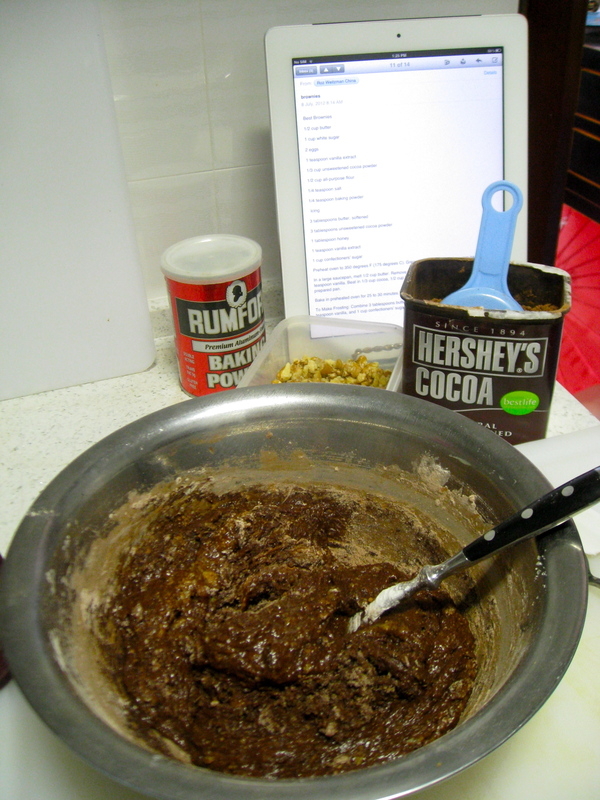 Scrumptious Fudge Brownie Recipe – Will My IPad End Up Like My Cookbooks? Will my iPad start to look like my cookbooks, all splattered with grease and food? The question comes to mind because I’m quite sure I’m not the only one who’s got the same issue with their eReader…and have purchased an eCookbook. It’s not a totally new trend and the idea’s simply infectious because of the convenience of eReaders. I’m catching up with the technology and since my ‘Secrets of Chinese Comfort Food” Cookbook will be launched for sale soon on smashwords.com I want to be ready, realizing all issues that an eCookbook purchase would entail. This is COOKING IN THE 21st CENTURY. I began using my iPhone to cook my recipes several months ago. I started emailing a recipe of something I wanted to cook to my iPhone and then used it while cooking. Problem was I never set the screen to stay ‘on’ so each time the screen shut down I’d have to look back to the recipe, I would have to touch the screen – doing the ‘swipe’ thing. So you can only imagine the mess I’ve made of my phone! Now I’ve switched to my iPad in the kitchen because it’s bigger and easier to read. Yesterday I put it on a plate stand so it stays upright perfectly (just like the Plexiglas cookbook stands they sold several decades ago) and the screen’s already set to stay on indefinitely so it was a perfect replacement for my cookbooks. I admit that I do adore cookbooks. The lovely pictures, the descriptions, the feel of a book….but I’m a convert to technology and always have tried to stay current. My iPad has become my library (I’ll never be without a good book to read – I’ve got over 70 books from my favourite authors on it). If/when I move again, I won’t have to worry about ‘schleping’ books half way around the world. And then there’s the cooking tutorial videos – but that’s a discussion for another day. It comes to mind that I shall upload my recipe books to my iPad permanently so I never have to email a recipe again, unless of course it’s one I’ve just created. In a bowl cream the butter and sugar together. Stir in the eggs, and vanilla. Beat in cocoa, flour, salt, baking powder, and walnuts until blended. Spread the batter into a parchment-lined baking pan. Parchment paper is my new best friend. Bake in preheated oven at 350 degrees for 25 to 30 minutes. Do not overcook – softer is better for this recipe. Remove from the pan together with the parchment paper and allow the brownies to cool for 15 minutes. While waiting for the brownies to cool, in the same bowl, make the frosting by combining the butter, cocoa, honey, vanilla, and icing sugar. Frost brownies while they are still warm so the heat from the brownies will slightly melt the frosting and help to spread it. 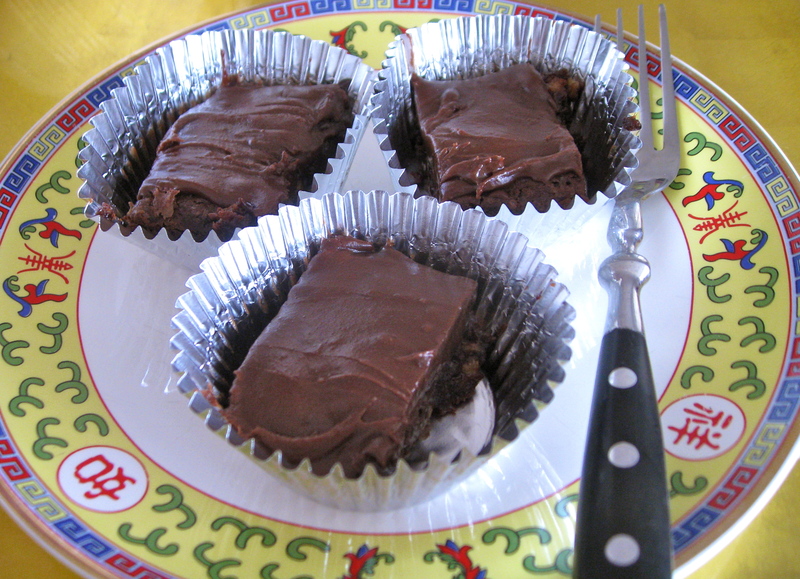 When completely cooled cut into squares by dipping a sharp knife into cool water before each slice and putting each brownie into paper cupcake cups for serving. These brownies freeze well in an airtight container.